The Center for Nanoscale Systems (CNS) is a shared-use core facility at Harvard University. Our scientific focus is the study, design and fabrication of nanoscale structures and their integration into large and complex interacting systems. The Center for Nanoscale Systems' Nanofabrication Facility, provides resource and staff support for fabricating and characterizing nanoscale devices and structures. The imaging team at provides a wide range of tools, training, and expertise, with a primary focus on providing access to world-class advanced electron microscopy instrumentation to the CNS community. The first NanoFrazor Explore DLS will arrive at CNS in early April 2019. Harvard is one of the beta-testing sites for the new instrument, so CNS users get the chance to exploit the advanced features as early as possible. 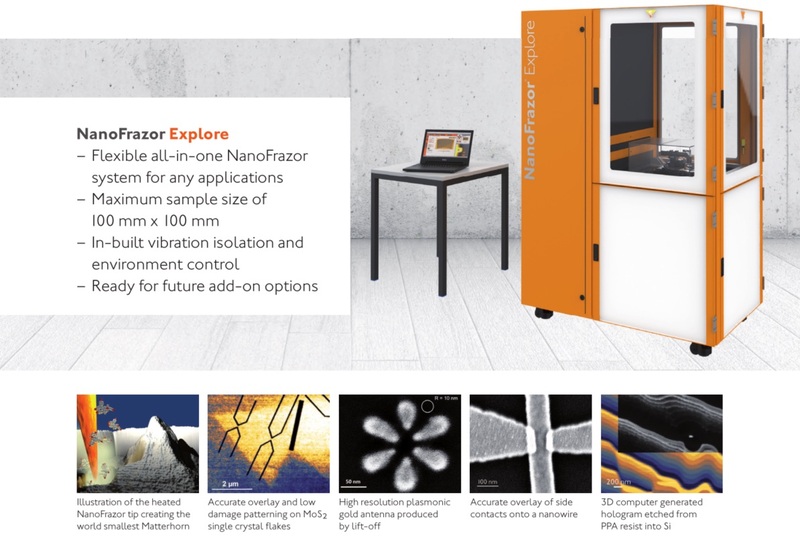 Beta testing of the NanoFrazor Explore DLS will kick off with a webinar for prospective users, introducing the fundamentals and the possibilities of the tool. The webinar will take place on March, 27th at 10 AM EST (https://global.gotomeeting.com/join/424882261) Attendees of the webinar can sign up for training at the tool. Researchers are invited to contact the SwissLitho team with inquiries at any time to get application-specific support directly from the developers of the technology. After the installation, the NanoFrazor Explore DLS can be used by all CNS users and on-site trainings are offered. To further strengthen the knowledge of its tSPL technology and possibilities for cutting-edge device fabrication, we also will hold a seminar/workshop on May, 2nd (with Prof. Riedo* from NYU as a key speaker). 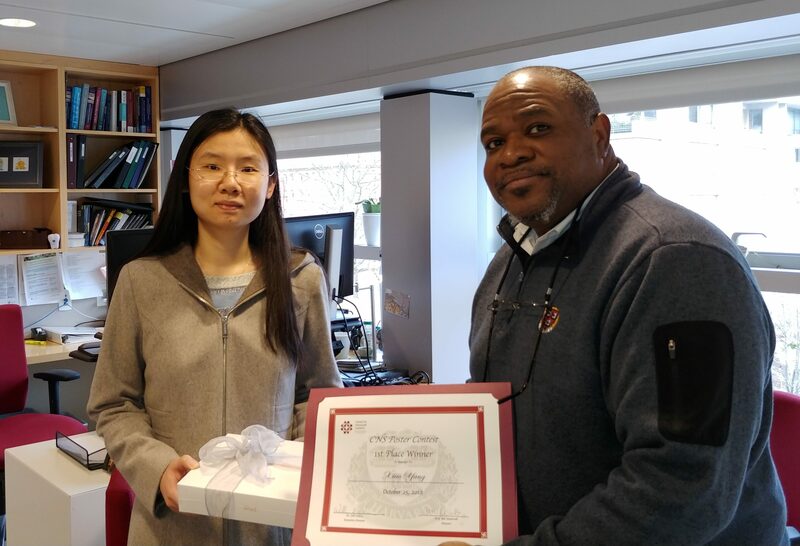 The Center for Nanoscale Systems (CNS) at Harvard University was created with a very clear vision: To provide a collaborative multi-disciplinary research environment to support of the creation and evolution of world-class nanoscience and technical expertise, for the Harvard research community as well as the larger community of external researchers both from academia and industry. As the New England hub of the NSF National Nanotechnology Coordinated Infrastructure (NNCI), CNS strives to be at the leading edge of science and technology, by providing world-class tools for world-class research, and by fostering a strong competitive edge for our nation’s investigators. Importantly we serve a broad, diverse, national set of users who are focused on meeting the nation’s needs in a wide range of next generation technologies. The focus of the technical team at CNS has been to develop specialized tools, processes, instrumentation, and expertise to help design, simulate, characterize, and fabricate novel materials, nanostructures, devices, and systems, going beyond conventional approaches. We invite you to join our research community, pushing the envelope of nanoscience and nanoengineering. Inspired by the human eye, researchers at the Harvard John A. Paulson School of Engineering and Applied Sciences (SEAS) have developed an adaptive metalens that is essentially a flat, electronically controlled artificial eye. The adaptive metalens simultaneously controls for three of the major contributors to blurry images: focus, astigmatism, and image shift. The research is published in Science Advances. “This research combines breakthroughs in artificial muscle technology with metalens technology to create a tunable metalens that can change its focus in real time, just like the human eye,” said Alan She, an SEAS graduate student at the Graduate School of Arts and Sciences, and first author of the paper. “We go one step further to build the capability of dynamically correcting for aberrations such as astigmatism and image shift, which the human eye cannot naturally do.” “This demonstrates the feasibility of embedded optical zoom and autofocus for a wide range of applications, including cell phone cameras, eyeglasses, and virtual and augmented reality hardware,” said Federico Capasso, the Robert L. Wallace Professor of Applied Physics and Vinton Hayes Senior Research Fellow in Electrical Engineering at SEAS and senior author of the paper. “It also shows the possibility of future optical microscopes, which operate fully electronically and can correct many aberrations simultaneously.” The Harvard Office of Technology Development has protected the intellectual property relating to this project and is exploring commercialization opportunities. To build the artificial eye, the researchers first needed to scale up the metalens. Metalenses focus light and eliminate spherical aberrations through a dense pattern of nanostructures, each smaller than a wavelength of light. Earlier metalenses were about the size of a single piece of glitter. “Because the nanostructures are so small, the density of information in each lens is incredibly high,” said She. “If you go from a 100 micron-size lens to a centimeter-size lens, you will have increased the information required to describe the lens by 10,000. Whenever we tried to scale up the lens, the file size of the design alone would balloon up to gigabytes or even terabytes.” To solve this problem, the researchers developed a new algorithm to shrink the file size to make the metalens compatible with the technology currently used to fabricate integrated circuits. In a paper recently published in Optics Express, the researchers demonstrated the design and fabrication of metalenses of up to centimeters or more in diameter. “This research provides the possibility of unifying two industries, semiconductor manufacturing and lens-making, whereby the same technology used to make computer chips will be used to make metasurface-based optical components, such as lenses,” said Capasso. 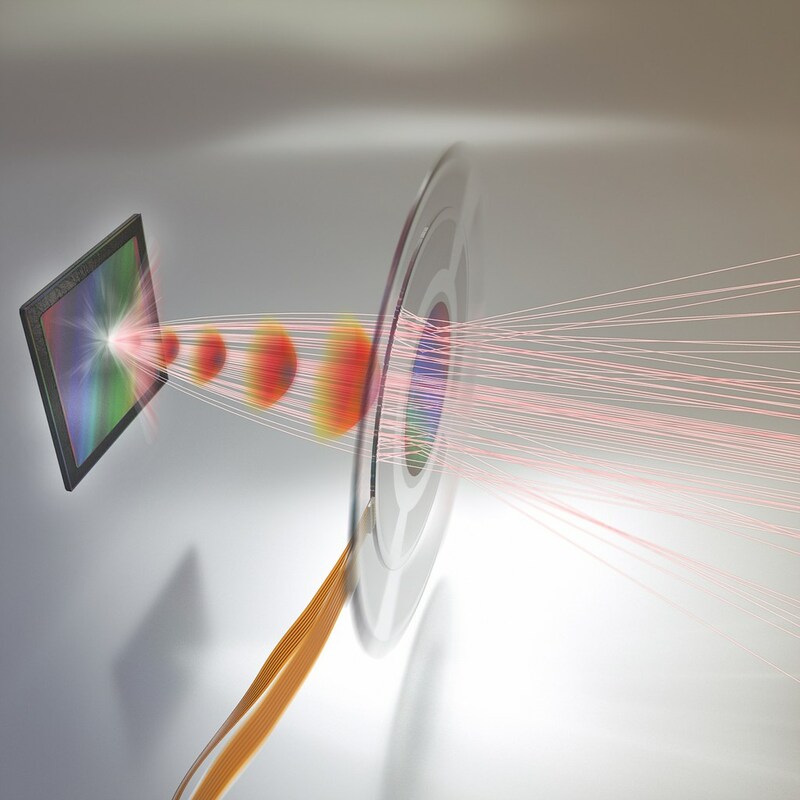 Discovery should lead the way to lighter, less-bulky cameras, telescopes, and cellphones, SEAS researchers say Next, the researchers needed to adhere the large metalens to an artificial muscle without compromising its ability to focus light. In the human eye, the lens is surrounded by ciliary muscle, which stretches or compresses the lens, changing its shape to adjust its focal length. Capasso and his team collaborated with David Clarke, Extended Tarr Family Professor of Materials at SEAS and a pioneer in the field of engineering applications of dielectric elastomer actuators, also known as artificial muscles. The researchers chose a thin, transparent dielectic elastomer with low loss — meaning light travels through the material with little scattering — to attach to the lens. To do so, they needed to develop a platform to transfer and adhere the lens to the soft surface. “Elastomers are so different in almost every way from semiconductors that the challenge has been how to marry their attributes to create a novel multifunctional device and, especially, how to devise a manufacturing route,” said Clarke. “As someone who worked on one of the first scanning electron microscopes (SEMs) in the mid-1960s, it is exhilarating to be a part of creating an optical microscope with the capabilities of an SEM, such as real-time aberration control.” The elastomer is controlled by applying voltage. As it stretches, the position of nanopillars on the surface of the lens shift. The metalens can be tuned by controlling both the position of the pillars in relation to their neighbors and the total displacement of the structures. The researchers also demonstrated that the lens can simultaneously focus, control aberrations caused by astigmatisms, and perform image shift. Together, the lens and muscle are only 30 microns thick. “All optical systems with multiple components — from cameras to microscopes and telescopes — have slight misalignments or mechanical stresses on their components, depending on the way they were built and their current environment, that will always cause small amounts of astigmatism and other aberrations, which could be corrected by an adaptive optical element,” said She. “Because the adaptive metalens is flat, you can correct those aberrations and integrate different optical capabilities onto a single plane of control.” Next, the researchers aim to further improve the functionality of the lens and decrease the voltage required to control it. To read the full story visit the Harvard Gazette website.